First, within the raging confrontation over economic policy between “pragmatic” and “ideological” factions of the ruling Partido Socialista Unido de Venezuela (United Socialist Party of Venezuela—PSUV), Maduro has found himself both dependent on militant chavista “colectivos,” and simultaneously at risk of these groups turning against him. These often-armed, barrio-based gangs are aligned with the PSUV’s ideological faction and have no patience for pragmatic economic reforms. Second, Maduro faces low voter approval ratings due to the continued collapse of the Venezuelan economy. As a result, he clearly fears triggering a popular backlash against the pain that reforms would bring in the near-to-medium term—and the danger that the ideological wing of his party would seize upon any such opportunity to denounce him as a “neoliberal” and push him from power. In this domestic paralysis on economic reforms, Maduro has consistently focused on acquiring stop-gap cash infusions from abroad. On January 5, he left on a hasty, ill-prepared globe-trotting trip to Russia, China, Qatar, Iran, Saudi Arabia, Algeria, Portugal and then on to Brazil. In Caracas, even in pro-government circles, the joke of the day was that Maduro’s staff in the presidential palace was watching the fax machine for word of his resignation. In reality, the trip was a replay of the failed plan pursued during his first year in office. That economic plan had consisted of promises to launch a new domestic dollar exchange, which Maduro had imagined China would finance—even though Beijing had long warned Maduro (and Chávez before him) to never ask for cash without strings again. So it was that Chinese leaders signed agreements to purchase oil fields and gold mines during Maduro’s September 2013 visit, but then refused to listen to his pitch for cash. The process was identical this time around: Beijing announced a $20 billion package of investments in Venezuelan projects. If and when such projects materialize, they would not provide cash to service the Venezuelan government’s debt or finance imports as oil prices fall. And, the same is true for Russian President Vladimir Putin’s pledged assistance, which was reported to target Faja Orinoco heavy-oil projects. Under these circumstances, Maduro’s administration has concocted another plan to rapidly raise cash. Instead of selling PDVSA’s U.S. affiliate, Citgo, as had been planned in 2014, it will now mortgage it. When Ramírez was company president in July 2014, he confirmed reports that PDVSA was looking to sell the U.S. subsidiary. Citgo has three refineries with a total capacity of 749,000 barrels per day (bpd), plus numerous pipelines and terminals (as well as a network of service stations that were not up for sale). Negotiations had already been underway for some months, according to a Venezuelan consultant close to PDVSA, and PDVSA claimed to have already received three bids. And in December 2014, bids of around $10 billion from named potential buyers were reported to be in hand. The timing seemed unusually good for a sale. Citgo’s Lemont refinery, located near Chicago, had been turning big profits from processing a regional glut of low-cost Canadian heavy oil—in preference to lower-margin PDVSA heavy oil that two Citgo refineries on the U.S. Gulf Coast are required to process under long-term contracts with PDVSA. Experts felt Lemont could fetch as much as four times the price of the other refineries. Ramírez was a staunch supporter of the Citgo sale. In June 2014, together with other pragmatists, he had succeeded in pushing leading ideological hardliners from power, and Maduro had even anointed him vice president for the economy—a sort of economic czar. It seemed Maduro was finally moving towards implementing reforms. But, in September 2014, Maduro ousted Ramírez from PDVSA and as energy minister, appointing him foreign minister. Then, on October 26, Finance Minister Rodolfo Marco Torres asserted that Citgo was no longer for sale, although sale-promotion activity actually continued well into December. In Venezuela, the attempted sale had been broadly viewed as counter to the national interests—not only by the opposition, which denounced the sale as “abandoning our traditional market” for heavy oil in the U.S., but also by the left wing of chavismo, which decried the sale as a neoliberal privatization. In my assessment, market and technical considerations undermined both critiques; however, the general outcry highlighted the growing lack of confidence in Maduro’s administration, and Maduro apparently lost his nerve to back Ramírez’ efforts to sell Citgo. So why has Citgo now definitively been taken off the block? The answer, it seems, is because the State’s foreign exchange coffers can benefit from a simpler and quicker infusion of cash by using Citgo as collateral on a double-digit-interest bond offer and loan—and also because the sale was very unpopular with the ruling left wing of the PSUV. Potential investors were briefed at a meeting in New York on January 22. According to Reuters, the collateral Citgo will offer in return for $2.5 billion in bonds and loans is $0.75 billion worth of its midstream assets, which involves assets for the transportation (presumably via its pipelines), storage, and wholesale marketing of its crude or refined petroleum products, as well as almost half of the company’s equity. Citgo has indicated it is offering the loan at 8 percent over the present Libor rate, according to the sole manager of the proposed deal, Deutsche Bank. Reassuring investors, a Citgo executive at the meeting said the company would not now be sold—as its assets will be the deal’s collateral. “Although it is less than optimal to use Citgo to carry the debt of PDVSA, this makes us very comfortable that Venezuela will fully meet its debt payments this year,” said Daniel Freifeld, founder of Washington-based Callaway Capital Management, which owns both Venezuela and PDVSA bonds. 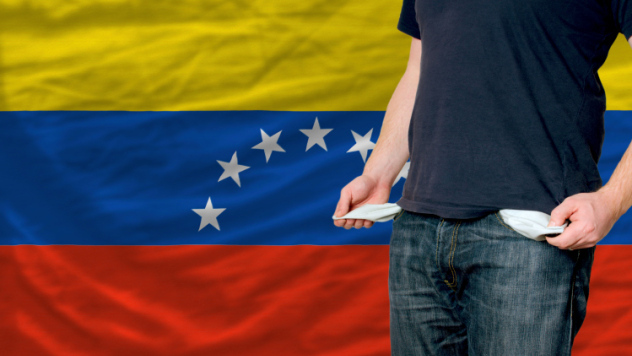 Although Venezuela succeeded in making 2014’s debt payments, the country owes some $10 billion more in 2015. In other words, by mortgaging off the last fairly well-functioning piece of the national oil sector, the Maduro administration and the ruling PSUV can muddle on, likely averting default for another year—though the falling oil price is a new major problem. However, there is still a domestic threat to Maduro’s continued rule. The key variable is how long the Venezuelan people accept (or can be forced to accept) food and medicine shortages, high crime rates, failing infrastructure, record inflation, and other hardships caused by economic and financial dysfunction and corruption. In the end, exchange rates, inflation, bond ratings, and the like do not determine a government’s lifespan; that is a function of when the people decide enough is enough. *Thomas O’Donnell, PhD, a former Fulbright Scholar in Caracas, analyzes global energy, especially oil, in international relations, and blogs at http://GlobalBarrel.com. This entry was posted in Chavez, Chavez lagacy, Faja of the Orinoco, Global Oil Market, heavy oil, Oil prices, PDVSA, Uncategorized, Venezuela oil and tagged Citgo, economic reforms, Heavy crude oil, Hugo Chávez, Nicolás Maduro, oil sector, Partido Socialista Unido de Venezuela, PDVSA, Petróleos de Venezuela, Rafael Ramírez, United Socialist Party of Venezuela—PSUV, United States, Venezuela, Venezuelan President Hugo Chávez. Bookmark the permalink.